Across the trail from the Vegetable Garden is the Demonstration Flower Garden, which has four raised beds, each 32 x 4 feet. The flower beds contain many seasonal and perennial flowers such as Mexican Sunflowers, Joe-Pye Weed, Yarrow, Balsam, Guara, Salvias, Firespike, Poppies, Dutchman Pipe Vines, Porcelain Vines and Plumerias (frangipani). 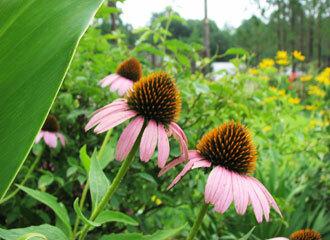 This garden is maintained by the Wiregrass Master Gardeners.